This species is accepted, and its native range is Borneo (Sarawak: Gunung Buri). Known only from G Buri on the border between 1st and 2nd Divisions. Endemic. Solitary small rattan, stemless or with a short erect or decumbent stem to 1 m tall; stem without sheaths to c. 12 mm diam., with sheaths to c. 25 mm, internodes c. 20 mm only. 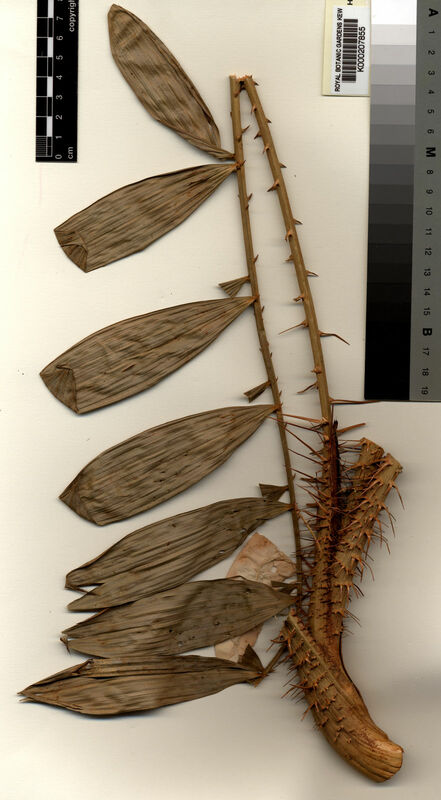 Sheath mid green, bearing numerous flattened brown spines 2-20 mm long, arranged in partial whorls or short horizontal groups, thin scales present between the spines; knee absent, ocrea thin, soon tattering. Flagellum absent. Leaf ecirrate, 90 - 120 cm long including petiole; petiole to 60 cm, armed with sparse spines to 20 mm arranged in groups of 2 - 4, spines at the very base sometimes larger; leaflets 12 -15 on each side of the rachis, ± regularly arranged, very broad with hooded tips, the longest to c. 20 x 6 cm, dark shiny green, somewhat plicate, armed with conspicuous bristles near the tip, transverse veinlets conspicuous. Inflorescences shorter than the leaves, to 50 cm, the male more highly branched than the female; bracts closely sheathing, covered with dense indumentum, unarmed or sparsely prickly; partial inflorescences c. 7 in male, c. 1 - 3 in female; male rachillae distichously arranged, straight or slightly curved to 20 mm; female rachillae few and distant, c. 40 mm long. Mature fruit rounded, c. 8 mm diam., with a conspicuous beak 2.5x1 mm and covered in 17 vertical rows of matt brown scales. Seed c. 5 x 4 x 3 mm; endosperm homogeneous. Seedling not known (Fig. 66).